I know I missed day 7 of T. A. Barron Weeks here on Bit O' Everything, and I'm sorry. Health issues are causing concentration issues. Please bare with me while I try to keep things going with T. A. Barron Weeks. 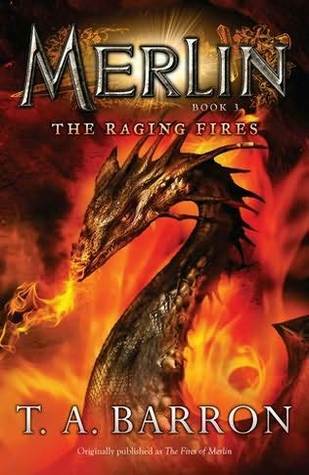 Merlin, The Raging Fires Book 3 of the Merlin Series is another great addition to T. A. Barron's wonderful creations through his writing. Another great adventure with Merlin where he overcomes many challenges come through in this next book. The Dragon turns out to be someone that we have all met in other books. That person, the dragon, is such a strange effect in Merlin's world. It's not a person you'd expect it to be. Merlin's mother is on the verge of dying due to his pride (ego one might say). As with any mother, she supports Merlin in his feelings and believes in him when he doesn't even believe in himself. His mother has the ability to connect with nature and trees and can see deep down inside of a person to see what they are feeling. She continues to support him, just as any mother would her child. Again, with all of Mr. Barron's books, the details are remarkable. There are real lessons to be learned about life within the Merlin series. This time, it was mostly about family, pride / ego and that everyone is special in their own way. He's also learned that things seldom ever go as planned. We all know that this is something that life is about in the real world, not just with Merlin himself. Book Rating (again) 5* all the way with two thumbs up.